Students - This week finds me in New York City....and many memories of living here in the early 90's. One of my favorite parts of the city is that there are just so many fabulous and exciting things to see and think about. Yesterday I took a walk and went in to Shakespeare and Company Bookstore on the Upper East Side. There I met sweet Harriet the cat, and she helped me choose a book. My visit to the bookstore reminded me of two favorite Cynthia Rylant picture books: The Bookshop Dog and The Cookie-Store Cat. I find something very charming about pets-in-unlikely-places. Writing this poem, I took a while to decide on where and how to focus. At first I planned to write about all of the things that Harriet does (and reads) in her bookstore...but then I began thinking about other cats, all around the world, and all of the places and ways that they live. That's when this became a list poem. Yesterday evening, my mom saw this photo and said, "You could write about city kitty!" That's where that wonderful rhyme came from - thank you mom! Do keep an eye out for things or creatures in unlikely places...a poem may be hiding there too. Betsy is hosting this past week's Poetry Friday roundup at I Think in Poems. You can catch up there to read the latest in the poetry Kidlitosphere. Precious! Such a way with words. You really never cease to amaze me with your spot on rhyming ability. And the surprise ending!!! I didn't focus on her in the pic at first. Now will read the rest of your post!!! I enjoyed Angela's video of her new kitty and the bigger one passing the ball. So cute!! Janet F.
PS Just read the post. Love how your mom gave you the idea for city kitty!! I love cats and cat poems. I didn't know where you were going with this list. A great exercise for students too. What a peaceful cat Harriet seems! I love cats, especially book store cats! I hope your mom is doing well. I grew up with a lovely cat named Cleo and would love to have one now but loved ones with allergies and asthma prevent me from owning one. I would love to go to this bookstore and visit with Harriet! Yay for bookstore cats! Lovely poem, and I'm glad Harriet helped you pick something out. I bet she has good taste. 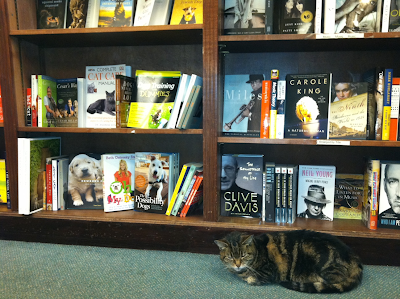 I'm very late to comment, but wanted to say in my second life I'd love a bookstore with a cat. Wonderful that you brought both good news about your mother and a poem back from NYC. Thanks Amy!